One of the great things about the arc of Tom Petty’s career is he got to have an entire musical experience that’s almost impossible to do these days. He learned to play guitar as a teenager and worked hard on his craft, had a regional following in Florida, and after a decade of performing landed a record contract in Los Angeles. He had 15 Gold Albums, and according to Billboard “scored a record 28 top 10 hits on the Mainstream Rock Songs airplay chart, more than any other act in the chart’s 36-year history.” He played concerts where he filled large stadiums, won Grammy Awards, traveled the world, got to perform with his musical heroes (Bob Dylan, Roy Orbison, George Harrison, Johnny Cash), and made music videos in the 80s and 90s when MTV was a force and there was a lot of money to make trippy videos. And for good measure check out this version of While My Guitar Gently Weeps. ‘Winter’s Bone (How it Got Made) One of my favorite films in last decade. P.S. I think Brad Pitt’s line in Fury —”Ideals are peaceful, history is violent”—is the most profound movie line this year. A quote that you’d expect attributed to Patton or Lincoln. If AFI ever does the list 100 Years…100 Profound Movie Lines, I expect that line to be there. And if that line was ad libbed on the set by Pitt (as Ayer’s has said in interviews) then Pitt deserves an ad lib line of the year award. Nobel Prize and Pulitzer Prize winning writer William Faulkner moved to Oxford, Mississippi when he was three and after a long life in literature, and a short career as a screenwriter in Hollywood, Faulkner died at age 64 and is buried in Oxford. I had been to Oxford before, but never on a college football Saturday, so I’d never seen The Grove in all its glory. The Grove has been called “the Holy Grail of tailgating sites” on the campus of the University of Mississippi. One saying at Ole Miss is, “We may not win every game, but we never lose a party.” They, in fact, didn’t win the game against Texas A & M which was decided by a field goal as time ran out. But before the game I got to witness what sets The Grove apart from other pregame atmospheres. The China ware, the chandeliers, and some of the students wearing jackets and ties. As people made their way into the stadium I headed over to The Square in Oxford where they have a statue of Faulkner. 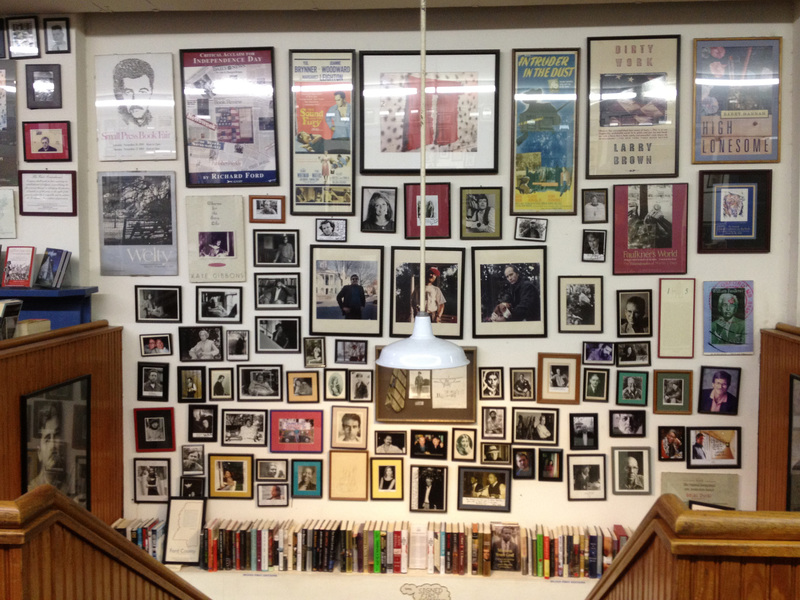 I stopped in Square Books where I took the above photo that is a parade photos of writers and their work. It seemed to me to a fitting postcard that represents Oxford at its best. A darker chapter of Oxford can be found in the lyrics of the Bob Dylan song, Oxford Town surrounding the events that happened in 1962 when James Meredith, a black man, enrolled at the University of Mississippi. But Oxford today is more than Faulkner and race relationships and is home to many artist and writers. Author John Grisham went to law school at the University of Mississippi and he lived in Oxford for a decade before moving to Virginia. So if you’ve ever enjoyed one of Grisham’s books or movies from his books, you can thank Ole Miss and Oxford for shaping his legal and literary mind. Over the years several movies have been made in Oxford including several based on Faulkner’s novels. One more recent connection to Oxford and Hollywood was the movie The Blind Side (2009) for which Sandra Bullock won an Oscar. That movie centers around the true story of Michael Oher and his transformation from a young homeless teenager to an NFL football player. He attended Ole Miss. In the movie they handle his steep educational learning curve in a kind of Rocky running up the steps montage. But in the book of the same name by Michael Lewis (which was the basis of the movie) you get a deeper grasp of what it took for Oher to raise his .09 GPA in high school to be eligible for college. His story is an amazing one, but I think his graduating with a degree in criminal justice in 2009 was an even greater feat than playing football in the NFL.